These Bacon Pancake Dippers from Cookies and Cups are the perfect weekend breakfast! 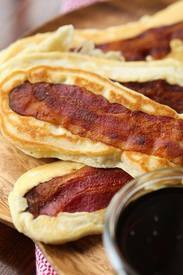 A soft pancake surrounds a crispy piece of Bacon that you can dip right in maple syrup! Your family will love this recipe! The process is actually pretty easy, AND feel free to make the bacon in advance! You could actually even cheat this step and buy the pre-cooked bacon! Go ahead, give them a try....your weekend breakfast will never be the same!